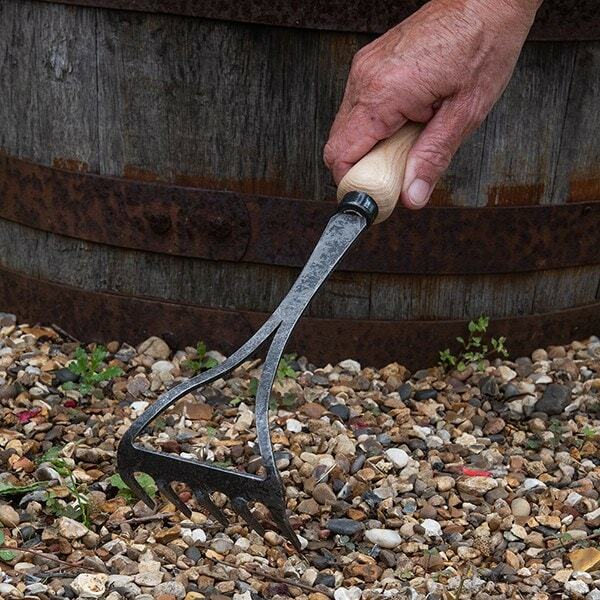 Buy De Wit 5 tine hand rake with short handle: <ul><strong><li>Forged from robust carbon steel</li><li>Shock resistant ash handle</li><li>Lifetime guarantee</li></strong></ul><br>This light and compact 5-tine hand rake, made from carbon steel and solid ash, makes light work of clearing leaves, weeds and other debris from flower borders and vegetable beds.<br><br>Designed for seated or kneeling use, the rake’s head is forged from one piece of steel for superior strength and bend resistance, with a ‘spring’ effect reducing impact on hands and wrists. 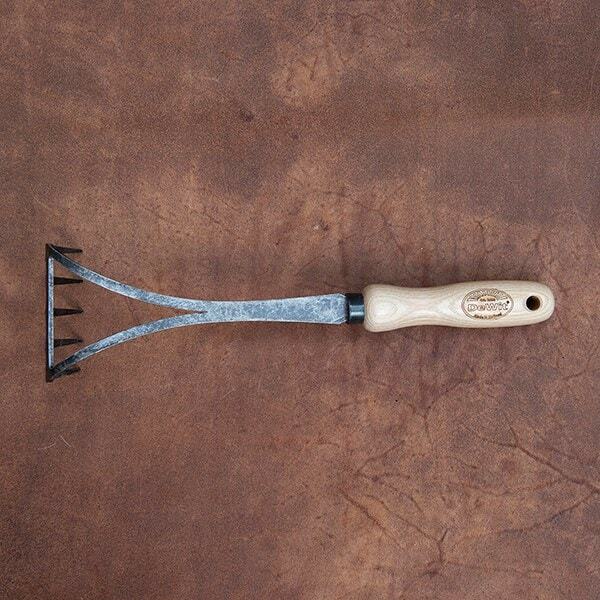 The smooth ash handle is ergonomically shaped to offer maximum comfort and a secure grip.<br><br>Measurements:<br>Head width 8.5cm<br>Total length 34cm<br><br><strong>About De Wit tools</strong><br><br>The Dutch are renowned for making the world’s finest garden tools, and De Wit is the most respected name of all. Founded in 1898, the family-owned toolmaker combines old-fashioned quality and craftsmanship with innovative design to create superior tools that last a lifetime.<br><br>Every tool is hand-forged in the Netherlands from tough boron steel - shaped, sharpened and burnished for durability, giving it the same blackened patina as traditional Edwardian tools. Each is fitted with an FSC-certified solid ash handle for ultimate strength and shock resistance, oiled to provide first-class protection against the elements.<br><br>All De Wit tools come with a lifetime guarantee against manufacturing defects, making them a truly once in a lifetime purchase. Handy for keeping small and tightly planted beds and borders well cultivated. I found the tool good in the Autumn and Winter for removing annoying, dead leaves around the base of shrubs and rose bushes. The temper in the forged steel is just right for a robust but light rake to do its job. Also good for preparing bald patches, in lawns, for re-seeding.